Muriquis have gray, yellow or brown fur; a heavy body; and long limbs. The southern muriqui has a black face, while the northern species' face is individually mottled. They can weigh up to 15 kg (33 lb). Found in the remnants of the Atlantic coastal forest in Brazil, muriquis are arboreal and diurnal and eat mostly leaves, fruit and flowers. They are able to utilize secondary as well as primary forest. Troops of muriquis have been observed to include from 8 - 43 individuals. They generally contain approximately equal numbers of adult males and adult females. Immature females emigrate from the troop in which they were born in search of a neighboring troop to join. Males remain with their natal troop and reproduce there. There is very little aggression among group members and they are not territorial. A single young is usually born during the dry season (May - September). The range of muriquis may originally have included all Atlantic coastal forests of eastern and southeastern Brazil. Currently, both species are found in highly fragmented subpopulations with low density. The distributions of the two muriqui species do not overlap. B. arachnoides is the southern species, occurring in the states of Sao Paulo and Parana, and B. hypoxanthus is the northern species, in the states of Minas Gerais, Espirito Santo, Rio de Janeiro, and, at least formerly, Bahia. The two species seem to be separated by the Serra da Mantiqueira which extends east-west in the south of Minas Gerais. *** The southern muriqui and the northern muriqui are both among the world's rarest mammals. *** The muriquis are the largest South American primates. *** The name "muriqui" comes from the Tupi Indians. On the basis of recent morphological assessments, the two former subspecies of muriqui, Brachyteles arachnoides arachnoides and B. a. hypoxanthus, are now recognized as full species, Brachyteles arachnoides (Southern Muriqui) and Brachyteles hypoxanthus (Northern Muriqui) (IUCN 2004) . For example, B. arachnoides and B. hypoxanthus differ in that B. arachnoides has a small but still obvious thumb, whereas B. hypoxanthus has no thumb at all (Nowak 1999) . The range of muriquis may have occupied all Atlantic coastal forests of eastern and southeastern Brazil, from southern Bahia to Sao Paulo and inland into Minas Gerais, prior to their extensive deforestation. As of 1962, muriquis were only known from the Tupi forests of the coastal area and coastal mountains of southeast Brazil, from the southern part of the State of Bahia in the north to Sao Paulo in the south, extending inland into Minas Gerais. By 1983 they were sparsely distributed and thought to occur in southeastern Brazil in the states of Sao Paulo, Minas Gerais and Rio de Janeiro. By 1997 their known range had been extended to the states of Espirito Santo and Parana. 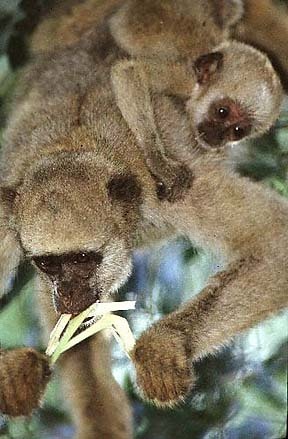 The distributions of the two muriqui species do not overlap. B. arachnoides is the southern species, occurring in the states of Sao Paulo and Parana, and B. hypoxanthus is the northern species, in the states of Minas Gerais, Espirito Santo, Rio de Janeiro, and, at least formerly, Bahia. The two species seem to be separated by the Serra da Mantiqueira which extends east-west in the south of Minas Gerais (Rylands et al. 1997) . Subpopulations of both species are highly fragmented and generally occur in very low densities (Rylands et al. 2004a, Rylands et al. 2004h) . Reasons for the decline of the muriquis include hunting for food by local natives, the use of infants as pets, and habitat loss due to clearing of forests for agriculture and human habitation. Currently, the major threats are commercial logging in privately owned forests and illegal hunting in federally or state-owned forests (Rylands et al. 2004a, Rylands et al. 2004h) . Muriquis have a length of up to 61 cm (2'). Females can attain a weight of up to 12 kg (26 lb); males can attain a weight up to 15 kg (33 lb). Muriquis are found in mature evergreen to deciduous lowland Atlantic coastal forest at altitudes from sea level to 1500 m (4900'). They are able to utilize secondary as well as primary forest. In disturbed forests, habituated muriquis appear to use all available strata, including the ground when they need to cross gaps in the canopy (Strier & da Fonseca 1996/7) . Females reach sexual maturity at an average age of 11 years, males at about 5.5 years (Strier & da Fonseca 1996/7) . One female had her first birth at about 7.5 years. Most births occur in the dry season from May to September. A single young is usually born. Twins are rarely observed. Six interbirth intervals averaged 33.8 months (range 26 - 39 months) (Strier 1991) . Weaning occurs between 14 and 18 months. As in many New World Primates, males are philopatric, remaining in their natal groups for life, whereas females generally disperse into other groups as they reach adolescence at about 5 - 7 years of age (Strier & da Fonseca 1996/7) . Muriquis are mainly folivorous during the dry season, while their diet includes mainly fruit, leaves and flowers during the rainy season. They also eat seeds, nectar, pollen, bark, bamboo and ferns. Over an 8 year time period, when the number of individuals in one troop increased from 22 to 43 individuals, the ratio of immatures:adults increased from 0.6 to 1.2 (Strier 1991) . The observed compositions of individual troops include one troop with 24 members, including 6 adult males and 8 adult females; and another troop with 13 members, including 4 adult males, 4 adult females and 5 young (Nowak 1999) . A male:female ratio at birth of 1:1.7 has been observed. Densities from field studies at all 19 locations where they have been found can collectively be characterized as follows: range: 0.0067 - 27.3 individuals/sq km (0.017 - 70.7 individuals/sq mi); mean: ~3.0 individuals/sq km (~8 individuals/sq mi); median: 0.25 individuals/sq km (0.65 individuals/sq mi) (Strier & da Fonseca 1996/7) . Some observations of group sizes and group home range sizes: 7 or 8 individuals on 170 hectares (420 acres), 13 individuals on 105 hectares (259 acres), 12 individuals on 217 hectares (543 acres), and 30 individuals on 580 hectares (1430 acres). One investigator reported that home ranges of females covered an estimated 70 hectares (170 acres), including a core area of 4 hectares (10 acres) where the animal often rested and slept. (Nowak 1999) . The home range of one troop was observed to be about 170 hectares (420 acres) when the troop numbered 23 - 27 individuals (density of 6.2 - 7.3 hectares/individual (16 - 18 acres/individual)) and about 184 hectares (460 acres) when the troop numbered 33 individuals (density of 5.6 hectares/individual (14 acres/individual)) (Strier 1991) . Preliminary genetic comparisons between individual muriquis sampled from one northern and one southern population reveal some of the highest levels of polymorphism and heterozygosity known for any primate (Strier & da Fonseca 1996/7) .